In March, ride hailing service Uber announced a raft of measures aimed at improving customer care services. The measures were in addition to the email support services users access through support@uber.com , where queries and complaints are passed over to local teams for expediting. 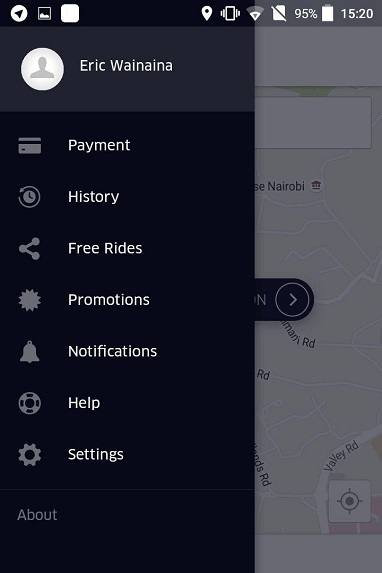 Uber launched services in Kenya last year, beginning with Nairobi. The service recently launched services in Mombasa and we believe in a matter of time services will expand to other cities. Upon making an Uber trip, one is asked to rate their ride based by giving it different stars ranging from 1-5. A 5-star rating means the trip was good while a 1-star rating means the trip was horrible. The star rating also applies to the driver, who gives you a rating based on how good a passenger you were during the trip. In the new measures Uber introduce was a “Know your rating”tab, that tells you how good a passenger you have been. Upon clicking on the settings tab, you are ushered into a tab with a whole range of options including merging your Uber accounts, resetting passwords, updating account information among others. Click the I’d like to know my rating option. You are then asked to submit to get your average rating for all trips you have taken on the service. I got a rating of 4.86, which is not really good. I apologize to the Uber driver I annoyed because I need a perfect rating :(. Now the Internet is literally having a meltdown for not having perfect ratings on the service. Many have taken to Twitter and other medium to protest their ratings while others proudly display their perfect ratings. My average Uber rating is 4.75 stars. I don't know how I feel about this. It's like how I was upset I got an A for an essay instead of A+. I have a 4.8 rating as an uber passenger. Who tf gave me less than 5 stars? Honestly…. Did I play James blunt too loud or something?